The HPCAT sector is located at sector 16 of APS, and consists of an insertion device undulator beamline (16-ID), a bending magnet beamline (16-BM), two support laboratories and an office area. The HPCAT design and construction effort began in 1998. 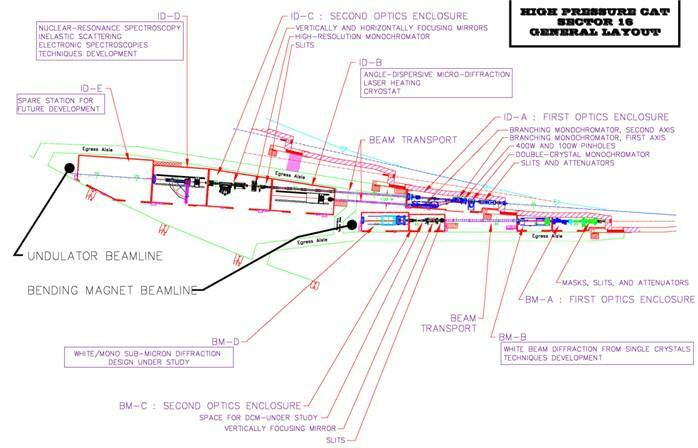 A detailed technical design of the sector layout and an optical scheme were completed in 2000. The construction of optical enclosures and experimental stations began in April 2001. First x-rays were observed from 16-ID in March 2002 and from 16-BM in June 2003. The remaining stations in the ID and BM beamlines were commissioned in the period 2003 - 2006. The first HPCAT experiment was conducted at the end of 2002. 16-ID and 16-BM have been open to general users since 2003 and 2006, respectively. The HPCAT beamlines consist of nine x-ray optics and experimental stations, five for the ID line: (sequentially downstream) 16ID-A, 16ID-B, 16ID-C, 16ID-D, 16ID-E, and four for the BM line: 16BM-A, 16BM-B, 16BM-C, and 16BM-D (Fig. 1). To increase the efficiency of precious beam time utilization, a maximum of four beamlines are simultaneously operated at 16ID-B, 16ID-C-D-E, 16BM-B and 16BM-C-D.
We have used a diamond double-crystal monochromator (DCM) to vertically diffract a monochromatic segment of the x-rays at 16ID into the 16ID-C-D-E stations for full time HP scattering and spectroscopy studies, and a branching DCM to horizontally diffract the transmitted x-ray beam (at a higher energy) to the 16ID-B station for full time HP x-ray diffraction (XRD) studies, thus creating two simultaneously operating ID lines. In 16-BM, the six mrad white radiation fan is divided into two parts: one into 16BM-B for HP white beam x-ray studies and the other into 16BM-C-D for HP micro XRD and x-ray absorption spectroscopy (XAS). Both white beam and monochromatic beam are available at the 16BM-D station.